A semi-truck that hauls vehicles crashed into a Hillsborough County Fire Rescue ladder truck early Monday morning on Interstate 75. 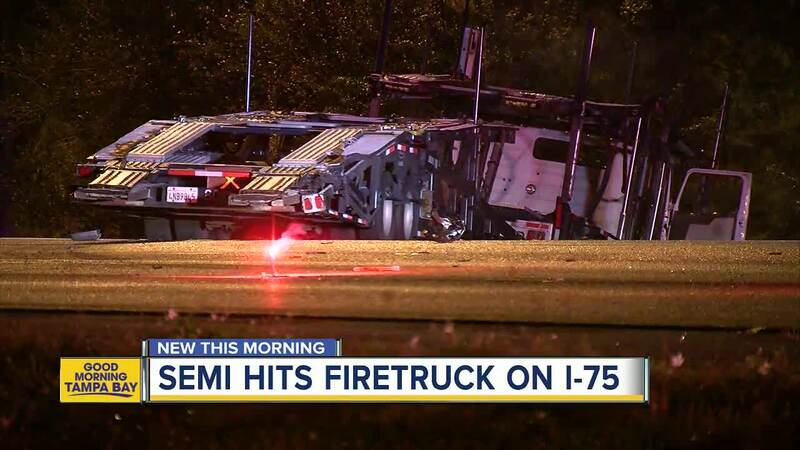 HILLSBOROUGH COUNTY, Fla. — A semi-truck that hauls vehicles crashed into a Hillsborough County Fire Rescue ladder truck early Monday morning on Interstate 75. The crash occurred just before 3:00 a.m. on northbound I-75 just south of College Avenue where deputies arrested a domestic violence suspect. Firefighters responded to the arrest location because the suspect suffered minor injuries during the apprehension. The ladder truck sustained significant damage and required a heavy duty tow to remove it from the interstate. Authorities say the semi-truck driver "did not see" the fire truck. Firefighters were not on the fire truck when the semi-truck crashed into it. No one was injured in the crash. The Florida Highway Patrol is conducting the crash investigation. It is unknown at this time if any charges will be filed against the semi-truck driver.